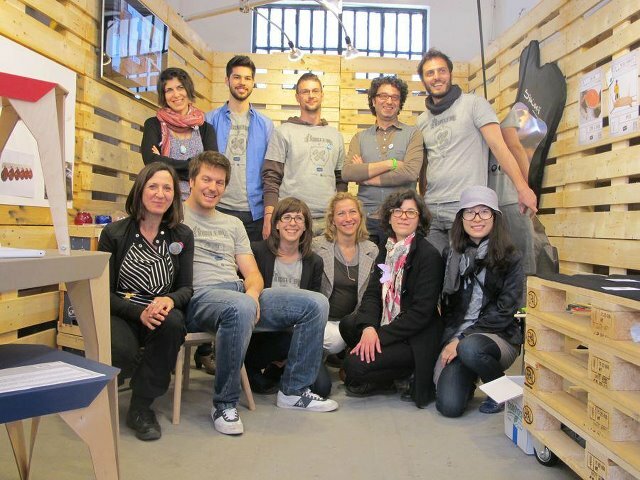 Above: designers at A designer A day stand, at Zona tortona, Milan Furniture Fair, 2012. Here is an interview of Tian Tang Design by BRANCHIE during Milan Furniture Fair, 2012.04. The desire to turn everyday situations into imaginative moments took me to Sweden to study MFA program called “Child Culture Design” which is the only one in its kind in the world focus on children, and among all, play, which is the primary activity in young people’s lives. By redesigning functionality in a playful way, I aim to enhance share, aspire other ways to live, learn and play. I strive to build a new type of product languages for children’s furniture which takes its departure from triggering informal play moments in daily life. I am inspired by Reggio Emilia’s educational philosophy, and among all, “environment as the third teacher”. Achille Castiglioni is my favourite designer. Currently I work as a freelance at the same time produce my collections in Sweden, and sell mostly in Europe. My parents are in China and my family is in Sweden. They are my best support. What about the project you are presenting at “A Designer A Day”? I am presenting two projects and three products at “ A Designer A Day” which represent my two years study at “Child Culture Design”. Come & Draw is my first project during that period. It begins as an idea to create a meeting place in the public places where children are triggered to play together and share stories. It starts as to find the play signal where the desire to play and share is revealed at the first place. It is a very semantic approach. The image of round indicates togetherness while an image of layers paper stack together indicates the accumulation of time and story. Later people even found the unique round paper is a nice way to frame children’s art work. As I expect, Come & Draw goes to museums in Sweden and Germany, formulating workshops and activities. One thing worthy to mention is that I found out that children begin to draw stories like sun rises and sets which related to “round”, and they love to run along the table and draw! Child’s Table is my graduation work whose theme is “play dissolves in daily life”. This project aims to discover play archetypes in everyday objects, redesign them in order to embrace children´s vivid activities and enhance the play value of ordinary things. I want to provide a kind of environment which triggers informal play and imagination. What does self-production mean for you? It means I can have the dialogue directly with customers. It means an intimate relation between me and my products which I enjoy. It means transparent process and authentic stories. It also means high price, less accessibility and a lot of work.